Transfer learning is a method of reusing a model or knowledge for another related task. Transfer learning is sometimes also considered as an extension of existing ML algorithms. Extensive research and work is being done in the context of transfer learning and on understanding how knowledge can be transferred among tasks. However, the Neural Information Processing Systems (NIPS) 1995 workshop Learning to Learn: Knowledge Consolidation and Transfer in Inductive Systems is believed to have provided the initial motivations for research in this field. The literature on transfer learning has gone through a lot of iterations, and the terms associated with it have been used loosely and often interchangeably. Hence, it is sometimes confusing to differentiate between transfer learning, domain adaptation, and multitask learning. Rest assured, these are all related and try to solve similar problems. In this article, we will look into the five types of deep transfer learning to get more clarity on how these differ from each other. This article is an excerpt from a book written by Dipanjan Sarkar, Raghav Bali, and Tamoghna Ghosh titled Hands-On Transfer Learning with Python. This book covers deep learning and transfer learning in detail. It also focuses on real-world examples and research problems using TensorFlow, Keras, and the Python ecosystem with hands-on examples. Domain adaptation is usually referred to in scenarios where the marginal probabilities between the source and target domains are different, such as P (Xs) ≠ P (Xt). There is an inherent shift or drift in the data distribution of the source and target domains that requires tweaks to transfer the learning. For instance, a corpus of movie reviews labeled as positive or negative would be different from a corpus of product-review sentiments. A classifier trained on movie-review sentiment would see a different distribution if utilized to classify product reviews. Thus, domain adaptation techniques are utilized in transfer learning in these scenarios. Different layers in a deep learning network capture different sets of features. We can utilize this fact to learn domain-invariant features and improve their transferability across domains. Instead of allowing the model to learn any representation, we nudge the representations of both domains to be as similar as possible. This can be achieved by applying certain preprocessing steps directly to the representations themselves. Some of these have been discussed by Baochen Sun, Jiashi Feng, and Kate Saenko in their paper Return of Frustratingly Easy Domain Adaptation. This nudge toward the similarity of representation has also been presented by Ganin et. al. in their paper, Domain-Adversarial Training of Neural Networks. The basic idea behind this technique is to add another objective to the source model to encourage similarity by confusing the domain itself, hence domain confusion. Multitask learning is a slightly different flavor of the transfer learning world. In the case of multitask learning, several tasks are learned simultaneously without distinction between the source and targets. 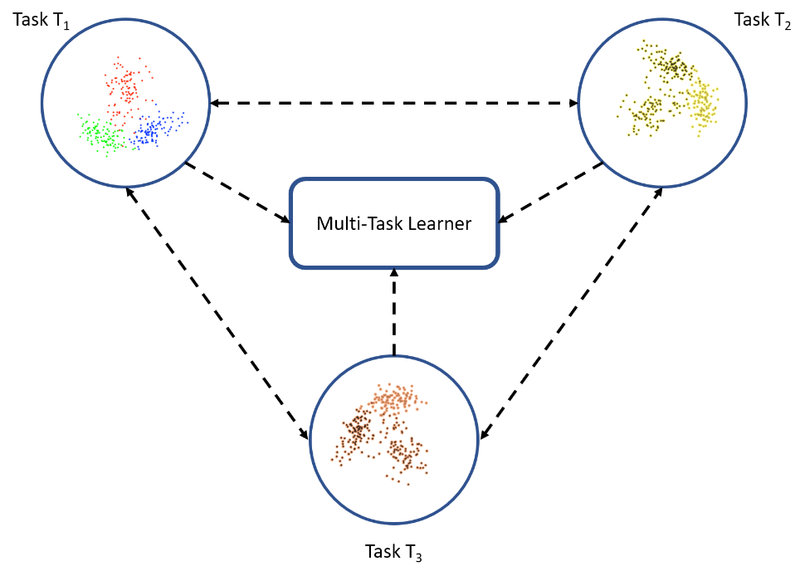 In this case, the learner receives information about multiple tasks at once, as compared to transfer learning, where the learner initially has no idea about the target task. Deep learning systems are data hungry by nature, such that they need many training examples to learn the weights. This is one of the limiting aspects of deep neural networks, though such is not the case with human learning. For instance, once a child is shown what an apple looks like, they can easily identify a different variety of apple (with one or a few training examples); this is not the case with ML and deep learning algorithms. One-shot learning is a variant of transfer learning where we try to infer the required output based on just one or a few training examples. This is essentially helpful in real-world scenarios where it is not possible to have labeled data for every possible class (if it is a classification task) and in scenarios where new classes can be added often. The landmark paper by Fei-Fei and their co-authors, One Shot Learning of Object Categories, is supposedly what coined the term one-shot learning and the research in this subfield. This paper presented a variation on a Bayesian framework for representation learning for object categorization. This approach has since been improved upon, and applied using deep learning systems. Zero-shot learning is another extreme variant of transfer learning, which relies on no labeled examples to learn a task. This might sound unbelievable, especially when learning using examples is what most supervised learning algorithms are about. Zero-data learning, or zero-short learning, methods make clever adjustments during the training stage itself to exploit additional information to understand unseen data. In their book on Deep Learning, Goodfellow and their co-authors present zero-shot learning as a scenario where three variables are learned, such as the traditional input variable, x, the traditional output variable, y, and the additional random variable that describes the task, T. The model is thus trained to learn the conditional probability distribution of P(y | x, T). Zero-shot learning comes in handy in scenarios such as machine translation, where we may not even have labels in the target language. In this article we learned about the five types of deep transfer learning types: Domain adaptation, domain confusion, multitask learning, one-shot learning, and zero-shot learning. Is the machine learning process similar to how humans learn?